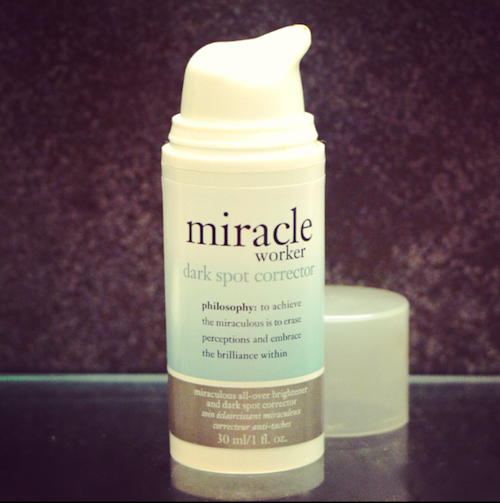 And so on with the review; this is the Miracle Worker Dark Spot Corrector from Philosophy, formulated to visibly improve the appearance of age spots, acne scars and sun damage. I’d never had any of these problems until earlier this year, when my acne finally cleared (thanks to the Milk Experiment) and I was left with small dark patches where the deeper, more pustulous spots had been. (I don’t know whether pustulous is indeed a word – my spellcheck says not – but I’m coining it.) In a way, the dark spots left over from my breakouts were worse than the original pimples themselves; they were really difficult to cover and looked pretty unsightly if I wanted to go out without any makeup on. It was almost bizarre that out of all of the “brightening and lightening” products I have waiting to be tested, I reached for the one from Philosophy. I’ve never really given anything from Philosophy a proper chance – the bubble baths were always tempting but a little over-scented, and I had been put off from the brand almost entirely by this awful body scrub that smelt like an old lady’s dressing table. But anyway, reach for the Miracle Worker I did, and for reasons yet unknown to myself, I continued to reach for it night after night for about two months. I say “for reasons yet unknown” because for quite a while – about four weeks – absolutely nothing happened. Now it’s quite difficult to test skincare properly, especially if it makes specific claims like “reduces dark spots”. It’s hard to see a difference unless you document it with very close-up photographs and even then, you can’t really catch the full impact on film. But in this case, I did start to see a very, very clear difference in my skin from around week six. It was brighter, more luminous, with an almost porcelain finish, and there was a definite change in the marks that the blemishes had made on my skin. Whereas they had been a mid-brown when I started, a dark freckle colour, they were now extremely faint. There were two in particular on my left cheek that had been quite dark and troublesome, and they were faded to a pale gingery-brown. Things that I love about this product? It worked! I also like the fact that it’s in a pump-action bottle so that the ingredients are kept nice and stable and that it’s a simple whack-it-on formula. Just cleanse, tone if you wish and then pop on the Dark Spot Corrector. I’m struggling to find things that I don’t like – previously it would have been the price, which at £52 would take it out of reach for the majority of people, but at its sale price it’s very reasonable indeed. Some might find the colour (brown) off-putting, but I don’t really care. This isn’t the most luxe looking product on earth and it doesn’t smell of roses or oranges or jasmine, but it seems to have really gone to town on brightening my skin and for that I am thankful. Please remember to use a daily SPF with this product and make sure that you apply it as a night treatment and not in the morning. Thank you – sermon over.